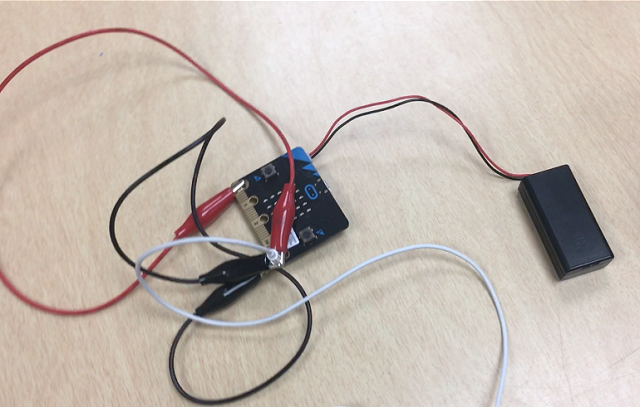 For this project, students should work in pairs to design a project that incorporates radio communication to send and receive data in some way. Some projects may have two separate programs: One that receives data, and one that sends data. Students might each choose to submit one program in that case. In other cases, a pair of students might submit one program that has both sending and receiving code in it, and the same code is uploaded to two or more micro:bits. Design an alarm system for your bedroom that alerts you with a screen animation when someone opens your door. You can mount one micro:bit on your door and use the accelerometer to send a signal over the radio when it is being moved. Create a piece of interactive artwork that receives something as input over the radio from another micro:bit, and displays something based on that as output. 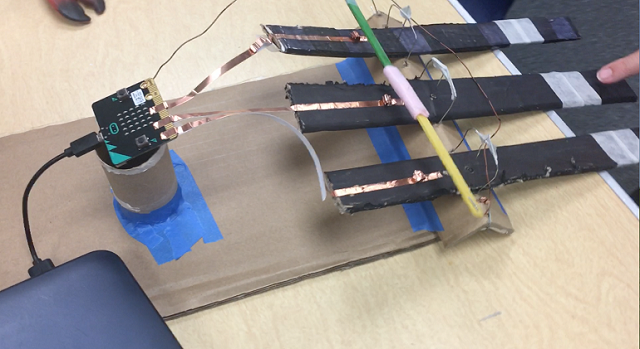 This is a simple three-note keyboard that uses wooden paint stirrers and copper tape to make a connection to each of the three pins on the micro:bit. When a key is pressed, it sends a number over the radio to a second micro:bit that plays the appropriate tone over a set of earbuds. This allows you to use each of the three pins on the first micro:bit to play a different tone. 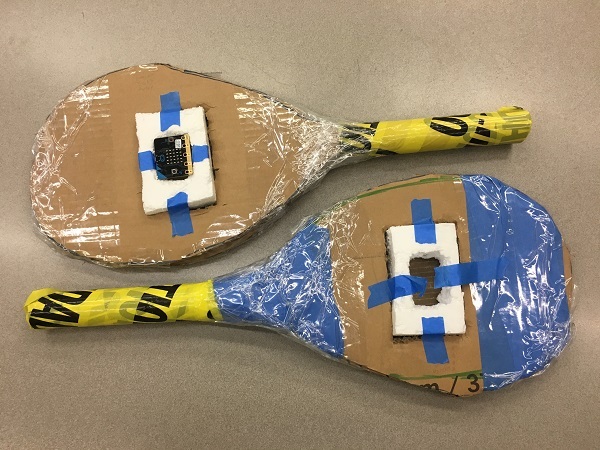 In this project, the tennis racquets alternate displaying a ball on the micro:bit LED screen. When you swing the racquet, the ball disappears from one micro:bit display and shows up on the other micro:bit’s display. What kind of Project did you do? How did you decide what to pick? How does your project use radio communication? Are there separate programs for the Sender and the Receiver micro:bits? Or 1 program for both? What feedback did your beta testers give you? How did that help you improve your design? 4 = Effectively uses the Radio to send and receive data, with meaningful actions and responses for each. 3 = Effectively uses the Radio to send or receive data, with meaningful actions and responses for each. 2 = Use of Radio is incomplete or non-functional and/or tangential to operation of program. 1 = No working and/or meaningful use of Radio.